(Phys.org) —NASA is proposing a mission study to open up the mysteries of Titan, the largest moon of Saturn. The reason is compelling enough. Titan would serve as a vast reservoir of information about one of the most earth-like worlds ever discovered. With its thick atmosphere and organic-rich chemistry, said NASA, Titan resembles a frozen version of Earth, several billion years ago, before life began pumping oxygen into our atmosphere. NASA's Larry Matthies, senior research scientist at the Pasadena, California, Jet Propulsion Laboratory, authored Titan Aerial Daughtercraft on the NASA website earlier this month. 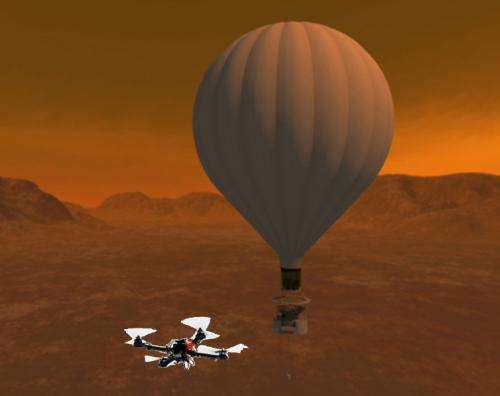 The proposed mission study involves a vehicle for Titan exploration, a rotorcraft, which would weigh less than 22 pounds. "We propose a mission study of a small (< 10 kg) (<22 pounds) rotorcraft that can deploy from a balloon or lander to acquire close-up, high resolution imagery and mapping data of the surface, land at multiple locations to acquire microscopic imagery and samples of solid and liquid material, return the samples to the mothership for analysis, and recharge from an RTG on the mothership to enable multiple sorties." "Saturn's giant moon Titan has become one of the most fascinating bodies in the Solar System. Titan is the richest laboratory in the solar system for studying prebiotic chemistry, which makes studying its chemistry from the surface and in the atmosphere one of the most important objectives in planetary science. The diversity of surface features on Titan related to organic solids and liquids makes long-range mobility with surface access important," said Matthies. The benefits of being able to analyze Titan's surface could, he said, teach volumes about prebiotic chemical evolution on a planetary surface.